Black slavery existed in supposedly free Minnesota. It happened primarily when U.S. Army officers stationed at Minnesota’s Fort Snelling brought slaves with them at the Army’s expense. This practice did not end until just before the start of the Civil War in 1861 as confirmed by the 1865 adoption of the XIII Amendment to the U.S. Constitution banning slavery in this country. 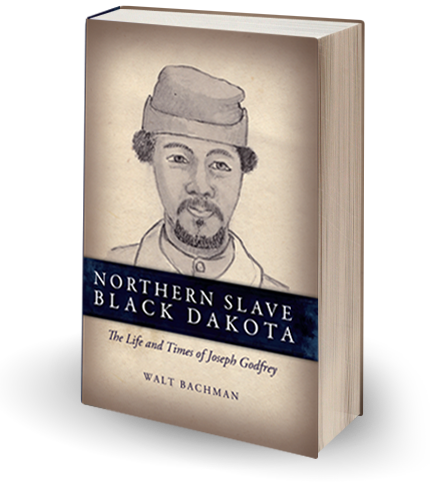 These are some of the startling findings in Northern Slave Black Dakota: The Life and Times of Joseph Godfrey by Walt Bachman, a former Minnesota attorney, an historian and friend. The focus of the book is Joseph Godfrey, who was born to a black mother (Courtney) and a French Canadian father in the early 1830’s in Mendota, Minnesota across the Minnesota River from Fort Snelling. At that time Joseph’s mother was a slave owned by Alexander Bailley, a prominent fur trader. She had been born into slavery around 1812 in Virginia and was owned in that state by James Garland until 1820, when she was sold to his brother, U.S. Army Captain John Garland. The Captain then took her with him on Army postings to supposedly free Michigan and Wisconsin and then in 1826 to Fort Snelling. During this time Garland claimed and received extra compensation from the Army for Courtney until he sold her in 1831 to Bailley. By virtue of his race and parentage, Godfrey upon birth also was a slave owned by Mr. Bailley and is one of the few African Americans known to have born into slavery in Minnesota and the only one known to have grown from birth to adulthood there. Godfrey lived with the Bailley family in Wabasha, Hastings and Shakopee (then known as Faribault Springs), Minnesota. Probably in the 1840s Godfrey was sold or transferred to Bailley’s brother-in-law, Oliver Fairbault. In or about 1847 Godfrey escaped his owner and walked about 40 miles southwest along the Minnesota River to Traverse des Sioux, a village at a shallow river crossing. There he presented himself to Alexander Huggins, a militant abolitionist Presbyterian missionary whom he had previously met. 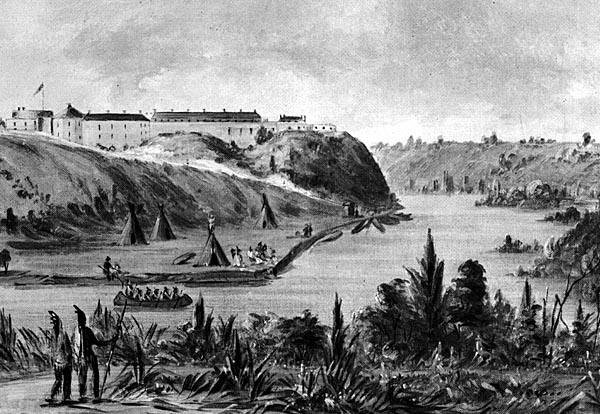 Almost immediately, however, Godfrey fled to join the Indian bands led by Chiefs Wabasha and Wakute along the Mississippi River. 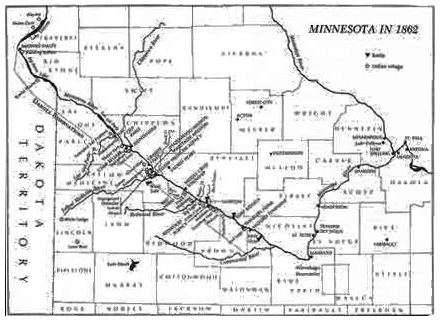 In 1853 Godfrey moved back along the Minnesota River in south central Minnesota after an 1851 treaty required those tribes to go to a new Dakota reservation in that location. In any event, Godfrey lived with Dakota Indians for over 12 years after his escape from his owner. Godfrey thus was living with the Dakota when the U.S.-Dakota War broke out and he joined the Indians in that War. On August 18th he was with a Dakota war party that attacked farmers in Milford. Afterwards he said he had killed several men and children that day although the subsequent military commission apparently did not believe any such statements as he was acquitted of murdering anyone himself. Godfrey also participated in other battles of the War. Exactly what he did in these battles is unclear, but in any event on or about September 24th he along with some of the Dakota warriors surrendered to the U. S. Army. Later he was tried and convicted by a military commission as will be discussed in a subsequent post. Godfrey was not the only slave living in Minnesota during these years as Bachman’s book explains. One of these other slaves was Dred Scott, who lived with his owner, Dr. John Emerson, while he was posted at Fort Snelling from 1836 to 1840. Scott, of course, was the subject of the infamous U.S. Supreme Court case of 1857 holding that Scott because he was black was a non-citizen who had no right to bring a claim in a federal court and invalidating as unconstitutional the Missouri Compromise law of 1820-1821 prohibiting slavery in the Northern territories. Today Fort Snelling is close to the Minneapolis-St. Paul Airport and is a National Historic Landmark operated by the Minnesota Historical Society. It is named after U.S. Army Colonel Josiah Snelling, the first Commandant of the Fort while he owned slaves. The 2013 book is published by Pond Dakota Press, a division of the Pond Dakota Heritage Society of Bloomington, Minnesota ((ISBN 978-0-9850099-0-8. Gideon and Samuel Pond were 19th century Presbyterian missionaries to Minnesota. Bachman is working on another book about the Army’s more general pre-Civil War promotion of slavery in the U.S. The current Minnesota city of Faribault is named after Oliver’s brother, Alexander Faribault. This river crossing was used by generations of Dakota and early French fur traders as a trading outpost. Traverse des Sioux was the site of treaty negotiations in 1851 between the U.S. government and the Dakota. Today the Nicollet County Historical Society operates the site as well as the adjacent Treaty Site History Center. This post focuses on the book Northern Slave Black Dakota giving a detailed account of Joseph Godfrey who was born to a black mother and French Canadian father. Since, Godfrey’s mother was a slave Godfrey himself was then born into slavery. The city of Faribault is not named for Oliver. It was named for his older brother, Alexander. Alexander was a much more respected and highly moral person. He played a significant roll in Minnesota history and was considered a kindsman of the Dakota as well as a trusted friend of Henry Sibley.